for what is already,IMO, the best resource for arms& armour enthusiasts of all levels of interest. I promise not to go a-rieving and I SWEAR I won't antique this one! Is it just me or did you ...??? Oh, I did, I did! Can y'all ever forgive me? I knew somebody would mention this but here's my excuse....I asked ElJay for some additional info about the weapon and, without a word from me, he encouraged me to experiment with antiquing the piece. So, with it's daddy's approval, I figured it was OK. Plus, something about the post-production black finish started to react with the brazing of the pommel to create a white crusty substance. So I felt the finish had to come off anyway. I just rubbed the hilt with steel wool and initially got bright steel highlights over black recessed areas and the finish was a dead ringer for the classic "black & white" armours of the era. Went ahead and cleaned it all off, though, and I'm pleased with the result (as is ElJay, by the way!) I still haven't gone a-rievin', though. Love the piece. It might have been an unusual blade choice ca. 1560, but not out of the question. Agreed! I love to see people's home projects. It's inspiring, for one, and it's great to see the usual production swords in a new light. 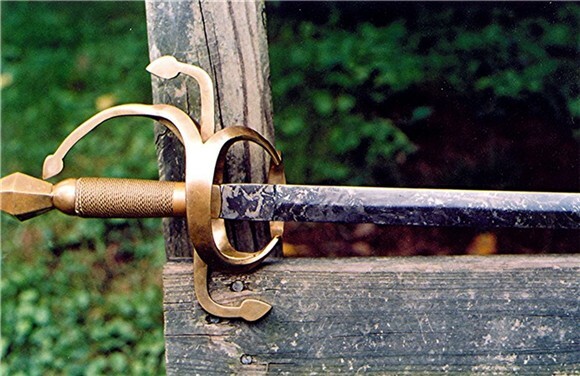 Thinking Sean has seen this but, here's a brass swept hilt I did a month or so back.